Creating Brand Relevancy by Engaging and Inspiring Audiences through New Platforms. 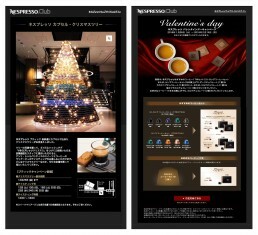 Nespresso wished to grow its business in Japan and be recognized as the icon for perfect coffee. The brand’s iconic global TVC campaigns featuring George Clooney were highly successful and resonated strongly in many markets, but research indicated lower than optimal relevancy in Japan. Additional approaches were needed to move the target audience in Japan, and Ad-comm was engaged to provide a strategic direction. Japanese consumers are known for their love of premium brands—but they are discerning, demanding to see the trustworthiness, innovativeness and reliability of the brand in order to view its products favorably. Brand affinity/loyalty must be earned, and it is up to the brand to make sure that is well understood. Ad-comm Group developed and executed integrated communications programs that moved the target audience from awareness of Nespresso through the Clooney TVC, to market relevant consideration and purchase. Our approach was to create brand understanding, and subsequently aspiration for the Nespresso proposition by combining the Clooney campaign with locally relevant communications. We have created digital and experiential platforms, and provide media content that enhances brand comprehension. Our strategy has included tasting events for consumers and media, co-marketing initiatives with relevant premium brands, and an influencer engagement program. The robust digital platform we created has resulted in on-going engagement with users and target consumers. Aligned with Nespresso’s marketing plan, we conceptualize and develop exciting content for promotions and seasonal campaigns.